The San Francisco Giants aim for their fourth straight World Series title in even-numbered years (2010, 2012, 2014), and they navigated through the Wild Card game successfully on the road to their last title. They’ll hope that the National League Wild Card game will be the precursor for some more even year magic, but the visitors enter the game with little momentum and really struggled through the last three months of the regular season. The New York Mets were a MLB-best 27-13 over the final quarter of the season and look to reach the World Series for the second straight season. San Francisco opened as a small underdog but the teams are now even money at just about every book, with 55 percent of the wagers coming in on the Giants. The total is holding steady at the opener of six runs. This might look like a really low number, but the under is 94-64-8 in games with a total set at six runs or fewer since the start of the 2014 season. Mad Bum is 5-0 with a 1.80 ERA and .189 batting average against in six career starts against the Mets. He’s not been great in recent starts; his ERA was 1.94 at the All Star break, but he’s just 5-5 with a 3.80 ERA in his 15 starts since. Bumgarner picked up the win in his last start when he tossed 7 1/3 innings against the Dodgers, allowing three runs on eight hits with a walk and five strikeouts. San Francisco averaged 4.41 runs per game during the regular season, 4.25 runs per game on the road. Syndergaard is 1-2 with a 3.66 ERA and 1.12 WHIP in three career starts against the Giants. He held the Marlins to one run on five hits with no walks and eight strikeouts in six innings of a 12-0 victory his last start. Syndergaard may only be in his second season in the big leagues, but the 24 year old proved himself ready for the big stage last fall when he went 2-1 with a 3.32 ERA and struck out 26 in 19 innings in the postseason. New York averaged 4.14 runs scored per game during the regular season, 4.19 runs per game home at Citi Field. The Mets won four of the seven regular-season meetings to earn homefield advantage. 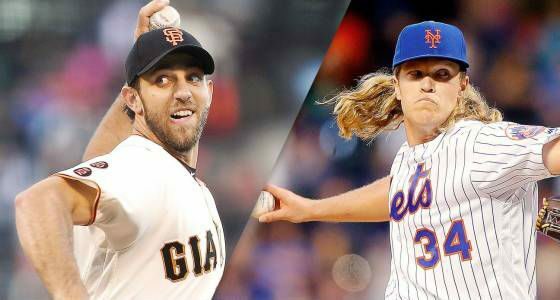 Syndergaard and Bumgarner squared off against one another May 1, when Bumgarner pitched six shutout innings while Syndergaard was charged with four runs in 5 2/3 innings in the 6-1 defeat. Giants are 9-3 in their last 12 playoff road games. Giants are 1-4 in Bumgarners last 5 road starts vs. a team with a winning record. Mets are 5-1 in their last 6 games vs. a left-handed starter. Mets are 13-6 in Syndergaards last 19 starts vs. a team with a winning record. Over is 6-1 in Giants last 7 games vs. a right-handed starter. Over is 7-1 in Mets last 8 games vs. a left-handed starter. Over is 5-1 in Bumgarners last 6 starts vs. Mets. Two low-scoring teams and a terrific pitching matchup, but only a few well-timed swings of the bats can be enough to push the game over the set number.